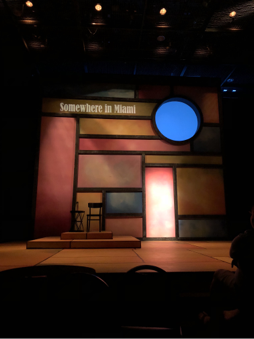 After finishing the first run of Elena Maria Garcia and Stuart Meltzer’s hilarious one-woman show “Fuacata: or a Latina’s Guide to Surviving the Universe” about a year and a half ago, the Adrienne Arsht Center for the Performing Arts thought it was too good for audiences to have seen it for the last time. SO they invited Zoetic Stage to remount their baby in the Carnival Studio Theatre at the Arsht Center! I was luckily invited to be apart of this performance through Zoetic Stage’s Young Artist program. This program brings in undergraduate college students studying theatre to work alongside theatre professionals. I am very honored to be apart of this team-my first professional production. 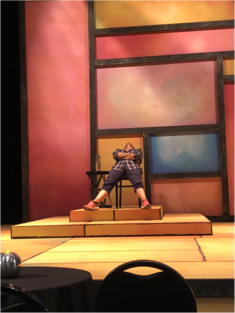 I have definitely learned a lot about the inner workings of a professional theatre company, and what it takes to put on a show the community wants to see. For my blog post, I’m going to share some of “behind-the-scenes” work that creates a lot of the magic you see onstage. When the rehearsal process is over, you enter “tech week”-this is the week leading up to opening night. This is when all the different technical aspects of a show (set, costumes, lighting, sound etc.) come together and mesh with the performers until everything is finely tuned and cohesive. Some of you may be thinking “psssh! this is a one-woman show, this must be a super simple and easy tech week!” …… you’d be wrong. 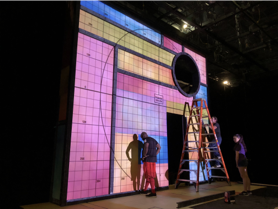 Sure, this show doesn’t require the monstrosity of a set needed for spectacular musicals or the intricate and delicate costumes called for in a Victorian comedy-but that does NOT mean it is easy. By any means. On Monday every technical team is locked and loaded forrrrr (drum roll) LOAD IN. This is go time. 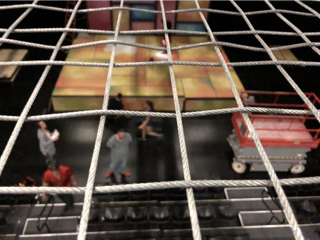 The set is brought in by Paul and his crew (pictured here) and put together on top of the deck assembled by the Arsht Center’s crew. Simultaneously, the lighting crew is working hard to hang the lights up in the eerie space known as the Catwalk (not for the faint of heart). 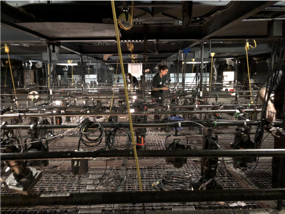 This “catwalk” in our theatre is a suspension grid (suspended surface grid of threaded metal wires where all the battens that hold lighting instruments). It is waaaaay above the audience, who normally won’t even look up at this area. If you’re afraid of heights this is NOT a place you’d want to be. This metal wiring is all that keeps my body from free fall. Super fun! You need to have a good attitude to work in Theatre-it’s a community of people who work together to take the audience on a journey to other realms. When problems arise along the way (as they usually do) everyone must put their heads together to come up with a solution that best serves the play. 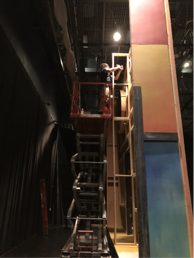 Someone who is a professional problem solver in the theatre is your Technical Director, and in this case that is Peter (Technical Director for the Arsht Center) and BJ (Technical Director for Zoetic Stage). They oversee all the work done during tech week to make sure everything runs as smoothly as possible. 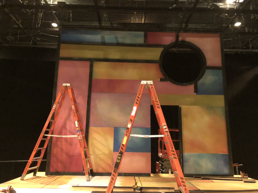 When looking at the set that was midway finished, Peter noted that when the cyclorama (“cyc” for short) is put up behind that circular opening in the set, the audience would be able to see above the cyc and notice the track that it hangs on. Becky works with “Q” to focus each light fixture to the correct intensity and location, this is called “focusing”. It’s because they focus every light to the specific place it needs to be for the show. Becky is seen here in the photo below! Now, we are ready for Cue to Cue!!! Cue-to-Cue, everyone’s favorite part of the theatre-making process. That’s a little joke. It is a tedious process when all the lighting and sound cues are synced up with the performer’s movements (called “blocking”). It’s like an awkward dance between the performer and technician; where the performer is stopped every thirty seconds of their blocking so the technical team can save and set cues. 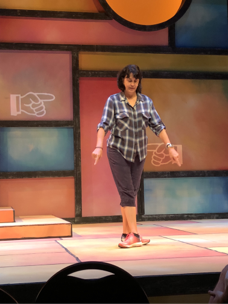 This process is critical to the success of any production-it can either immerse the audience in the world of a play or completely take them out of the experience altogether. The latter can be achieved with the slightest delay of a sound cue, so performers must exercise their best patience (it can be haaaaard). The Theatre is like a well-oiled machine. All the parts of the machine being the performer, set, costumes, lights, sound, makeup, and technical crew. The oil that makes this machine run smoothly is our fearless, fierce, and far-out Queen Amy! Without Zoetic’s Stage Manager, this show just wouldn’t happen. If you don’t get why Elena has her head thrown back in the above picture, its probably because you’ve never been on stage being incessantly stopped and having to wait an eternity to continue, just to be stopped again either by stage management or by your director. Just look at her calling those cues!!! Aaaaaaaaand once cue-to-cue is finished we are ready for FIRST DRESS! This is when Elena gets to put on her costume for the show and run it smoothly (hopefully) and start to get a groove and rhythm for how the show is running in the space. This is very important for the actor-who before today had been working in a completely different space, and was forced to imagine the environment around her. It has been an exceptionally educational and eye-opening experience to be apart of such a creative and forward thinking theatre company led by Miami’s most dynamic artists. 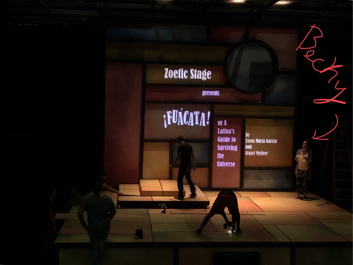 I can’t wait to see what is next for Zoetic Stage. I know that-like me-anyone who has a taste of what they have to offer this community will be left longing for more. Then…. we get to open this show for all of you lovely people! Your laughter and infectious energy is what we’ve all been waiting for at Zoetic Stage. I hope to see all of you at La Isla Cafè to experience Elena’s journey Wed-Sun until August 19th at the Adrienne Arsht Center!